When I saw this video of Burning Man participants reciting Dr. Suess’ ‘Oh, the Places You’ll Go’, I couldn’t help but think “what took someone this long to bring these two together?”. The video was shot at the 2011 Burning Man festival, held in Nevada’s Black Rock Desert each summer since 1990. This year’s event hosted nearly 54,000 people from around the world who danced, partied and embraced their inner-weirdness for a week. The video was directed by Los Angeles photographer and filmmaker Teddy Saunders of TedShots. The late 2010 change in the packaging of Lacta Chocolate from it’s iconic red and white paper to a new plastic wrapper brought with it an unexpected controversy. The paper wrapper had become well known as a medium for lovers to exchange romantic notes, and the brand had used this feature in its TV advertising for years. OglivyOne Athens has come up with a mobile app featuring augmented reality to help Lacta retain it’s status as a the chocolate of romance for Greeks. The app allows Lacta chocolate fans to write a message to a Facebook friend. The friend receives an alert that a hidden message is waiting for them with instructions to download the Lacta app to view the message. 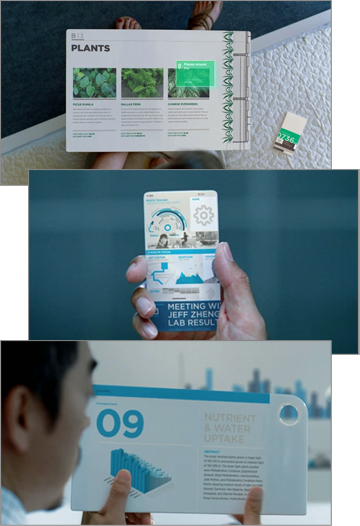 The viewer can see the message by purchasing a Lacta bar and holding it in front of the camera of their smartphone. The app is available in the iPhone and Android Marketplace. New York performance art group Improv Everywhere is back with another one of their Spontaneoud Musicals. This time the theme is the holidays and the theme that you’re never too old to sit on Santa’s lap. Other performances have been staged in food courts, grocery stores and even a social media conference. 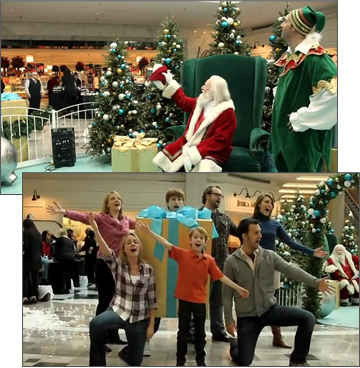 While some Improv Everywhere’s projects are unauthorized the Mall Santa Musical was performed with the cooperation of the mall. The musical was perfomed a few times during that day duirng the breaks of the ‘real’ mall Santa. As you can imagine, there is a significant amount of preparation and rehearsal involved in Improv Eveywhere’s performances and they’ve posted some behind-the-scenes pictures and video on their website. November 18, 2011 marks the 83rd anniversary of Disney’s Mickey Mouse’s debut in Steamboat Willie in 1928. It also marks the launch of Disney’s ‘Let the Memories Begin‘ campaign. To celebrate both events Disney brought a state-of-the-art augmented reality experience and a whole crew of well-known Disney characters to their store at Broadway and 45th street. Visitors who stepped onto the sidewalk marker were projected onto the 2000 square foot digital billboard where they could interact with the Disney characters. 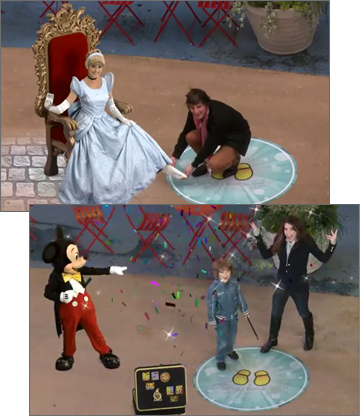 Unlike other AR experiences, many of the Disney characters were performing live allowing then to interact and respond to the participants on the sidewalk. Photos of the experience will be captured and emailed to the visitors, elements from the campaign can be followed on Twitter through the hashtag #DisneyMemories. 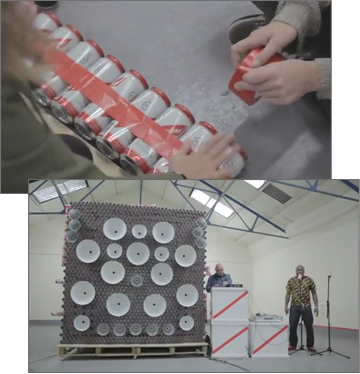 Red Stripe Lager UK commissioned sound artist Yuri Suzuki and designer Mathew Kneebone to create a sound sculpture as the first project in the ‘Make Something From Nothing’ campaign. The 2.5 metre tall sound sculpture is constructed from thousands of Red Stripe cans that were partly collected at the Notting Hill Festival back in August. The video above shows the sound sculpture being demonstrated by DJ Al Fingers, singer/songwriter Gappy Ranks. Yuri’s sound sculpture is inspired by the DIY spirit of the Jamaican DJs of Red Stripe’s homeland, who first created portable sound systems (a generator, turntables and massive speakers) in the late 1950s. They would load the systems onto trucks and drove to street parties. These DJs began playing American R&B records, but soon began producing their own recordings of local Jamaican music which eventually evolved into ska, reggae and dub, making them an essential part of music history. The Red Stripe sound sculpture was unveiled at the ‘Make Something From Nothing’ launch event in London’s Village Underground on November 16. 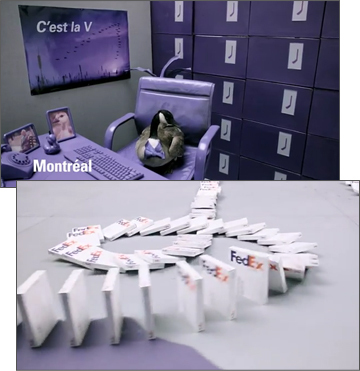 The route is represented by hundreds of Fedex boxes being toppled like dominoes. I love the moment where the large cylinder is pushed toward another group of boxes, then the boxes topple in a circle and roll back through the cylinder. I can’t wait to see the ‘Making Of’ video. I’m curious how just many shipping boxes were used as dominoes, and how many takes were required to get all the effects to work seamlessly. 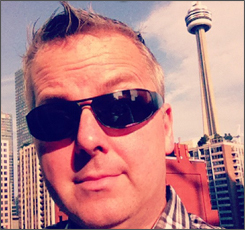 The ad was created by BBDO Canada. Earlier this year, Toronto ad agency john st created some buzz with ‘Pink Ponies’, a case study spoof detailing gow the agency created an effective promotional campaign about an 8 year old girl’s birthday party. Now John St is back with a new tongue-in-cheek video (embedded above) that reveals a surprising new direction, as they launch the world’s first Catvertising agency. The video is both funny and well produced, but the whole concept veers dangerously close to the Kittywood Studios mockumentary clip with over 500,000 views that was posted on YouTube in August by Pixels per Second. 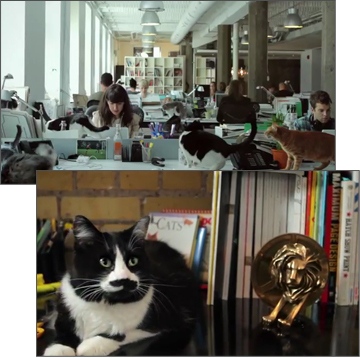 Maybe both these videos are simply playing off of the IKEA Herding Cats ad from 2010. In that project Mother London released 100 cats inside the Wembley IKEA store at night and filmed the results for a wonderfully effective TV ad. What do you think? Simple coincidence, or are these two kitty-inspired concepts a little too close for comfort? Since it’s launch more than 5 years ago Twitter has become the source of breaking news and commentary for dozens of major events around the world from air crashes, natural disasters, celebrity deaths, political debate and revolution. Before Twitter and Facebook our online discussions and sharing were mostly confined to commenting on news sites and blogs, instant messaging systems amongst our family and friends or literally hanging out at the office water cooler. It’s interesting to imagine how past events may have been discussed or shared if social networks like Twitter or Facebook existed back then. With that concept in mind, London ad agency muirhoward have taken that idea and created Network43, a campaign launched in honour of Remembrance Day. The campaign documents the experiences of four Londoners during the three weeks between October 20th and November 11, 1943. The campaign was inspired by conversations about the experiences of the grandmother of an muirhoward employee. The grandmother had been an evacuee during the war, and had attended 20 schools during that time. 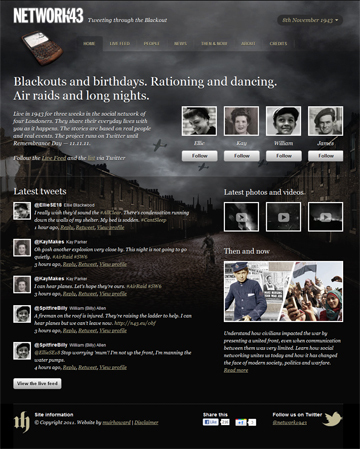 Four Twitter personas were created for the campaign including; Billy (@SpitfireBilly) a 14 year-old ex-evacuee; Ellie Blackwood (@EllieSE18), a 21 year-old factory worker; Kay Parker (@KayMakes), a 25 year-old school teacher; and Spr. James Campbell (@SprJames), a 28 year old soldier recovering from an injury. The information for the tweets was drawn from The British Library Newspaper Archive, Greenwich Heritage Centre, London Fire Brigade Museum, experts, as well as the personal accounts and diaries of people who experienced that time period. No matter where you are, you don’t have to miss a single mile of the 2011 ING New York City Marathon with the Official Spectator App created by the New York Road Runners MapMyRun. The app provides all the maps, guides and information that anyone will need to get up to speed before the event, and if you’re near the course in one of the 5 boroughs the app will help you find the nearest Subway (the app’s sponsor) for a quick snack. With the $2.99 in-app purchase (on iPhone) you’ll be able to watch the live NBC Channel 4 broadcast or feeds of the men’s and women’s leaders. The upgraded version of the app also gives you the ability to follow the progress – including unofficial and split times – of up to ten of the 47,000 runners or wheelchair athletes entered the race. If you’re running in the event, you can use the app to automatically post your splits and progress to Facebook or Twitter, or enable GPS to broadcast your exact location to your fans, friends and family. 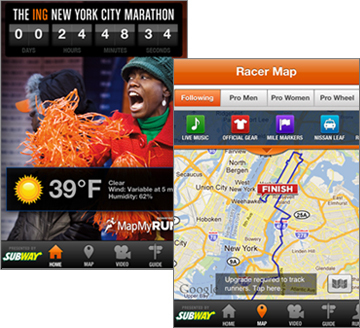 The ING New York City Marathon by MapMyFitness is available in the iPhone app store and Android Market.